Tropical North Queensland rainforest is to experience nature at its finest! The rainforest village of Kuranda, Pamagirri Aboriginal Dreamtime Walk, Pamagirri Aboriginal Dance Show, Amphibious Army Duck Rainforest Tours, and native Australian animals in the Koala & Wildlife Park complete a special day. Experience the Dreamtime Walk and learn of aboriginal culture, spear throwing demonstrations and try your hand at Boomerang throwing! See native wildlife close-up - kangaroos, dingoes, koalas, crocodiles and much more. Even hand-feed the kangaroos. Perhaps have your photo taken with a cuddling a koala or crocodile (own expense). Rainforestation Nature Park offers the World Famous BBQ Buffet Lunch in their very own restaurant (own expense). Australian Butterfly Sanctuary - the largest butterfly flight aviary and exhibit in Australia, home to over 2,000 magnificent tropical butterflies including the blue Ulysses and majestic green Cairns Birdwing. The sanctuary is an all-weather experience in the heart of beautiful Kuranda and offers guided tours through the aviary and breeding laboratory. Skyrail Rainforest Cableway - Ride over pristine rainforest just metres above the forest canopy. Short walks at Barron Falls and Red Peak offer stunning views and time to explore the forest floor. Sensational panoramic views of the Coral Sea, Cairns City, lush tableland region and mountain ranges. 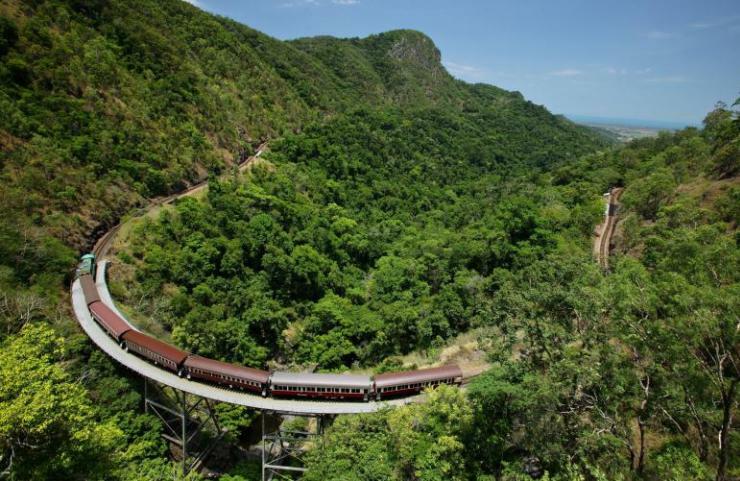 Scenic Railway - Board the Kuranda Scenic Railway for a spectacular journey with stunning views, pass massive Barron Falls, Stoney Creek and cross steep ravines. TOUR DEPARTS FROM CAIRNS ONLY.